Norfork Lake is in the midst of change from the cold water winter fishing pattern to the beginning of the spring fishing season. 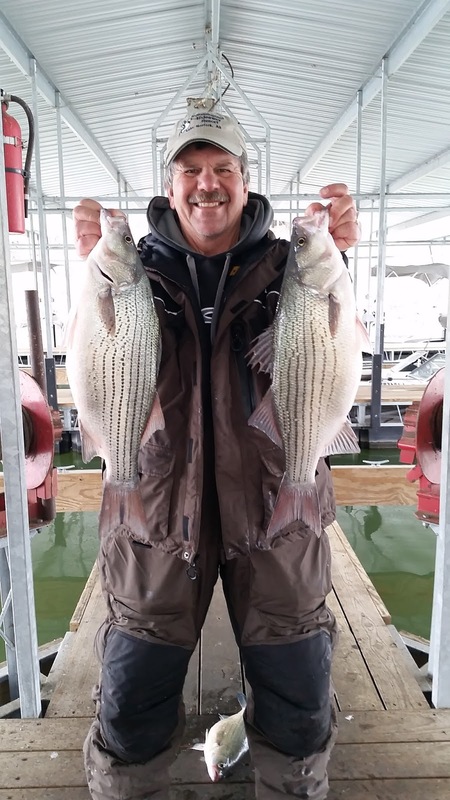 When the water temperature reaches the mid to low 40's during the winter season most species go to deep water and go into somewhat of a dormant state. As the water warms the fish start to get active and move up in the water column and begin to feed heavily. 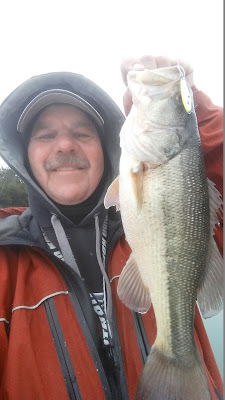 From past experience the mid 50's seem to be a magic temperature to get the fish going. We are almost there! Over the last week, after our heavy rains, I have seen many changes to the fish patterns. I am starting to find bigger shad moving off the bottom and am starting to mark some bigger arcs in or near these bait balls. I have also netted thread fin shad at my dock, which is a great sign for the bass fisherman. Typically I have found that shad move off of my dock when the water temperature drops below 50 degrees. I've caught a few bass up in shallow water and have found the big whites are starting to move out of the deep cold water. Hybrids are beginning to school up and are feeding heavily once you find them. 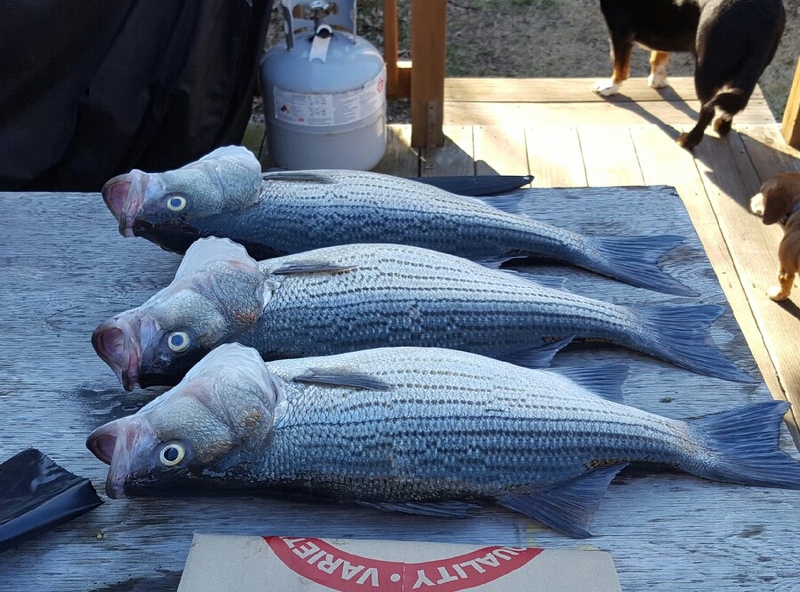 The striped bass are one of the last species to move out of the deep water, but I have seen a few caught over the last week. With the heavy rains and the fast rise in the lake level, parts of the lake has turned brown, but this will start to drop out very soon. The lake is still roughly 2 feet below normal pool so we are in great shape for this time of year. Today I headed up to Missouri waters graphing various spots as I went. I found the water to be brown from the mouth of my cove to just north of the Red Bank area. The water is stained in the Calamity area and continued to clear the farther north I went. I fished with live shiners from the Calamity to Cane Creek. I got lots and lots of bites, but very few fish. I believe most of my bites were white bass and walleye. It was breezy and I was drifting up river, probably faster than I should have been to catch the walleye. Yesterday I fished the 3 mid lake major creeks, found a lot of bait in 30 feet of water, but could only catch small whites. The water in these creeks are stained and in great shape. One of my guests fished in Float Creek this morning and hooked into several bigger fish and had great battles for 10 minutes or so each, but for various reasons lost each before getting to see them. Several days ago I headed into the Bennetts Bayou area where the water was brown with lots of floating debris. Yesterday a friend fished in the Bayou area and said the water is still brown, but there wasn't much floating debris. He ended up landing 3 nice hybrids on live shiners in the brown water. The fish were in 30 feet of water and suspended down 10 - 20 feet. I was fishing on the Cranfield flats a few days after the heavy rain and found large schools of hybrids and big white bass. You could tell the whites had just moved out of deep cold water as their coloring was really light and they were still very lethargic. 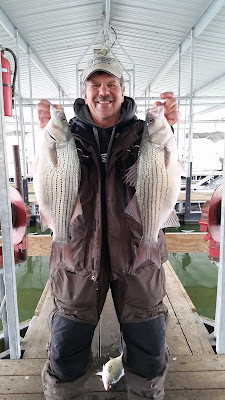 The hybrids I have caught are very aggressive and give a great fight. Some walleye have already moved to their spawning areas and others are staging and will soon follow. The walleye spawn typically lasts into April. White bass are starting to stage for their spawn. I am finding many of the males up the creeks, but the females are still waiting for the perfect conditions. 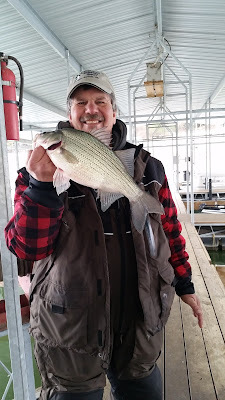 Assuming we don't get any severe cold fronts, the white bass spawn will be in full swing very shortly. The largemouth, spots and smallmouth will be on their beds typically during April & May. I will continue being out on the lake looking and fishing most days of the week. I am a early riser so I am typically fishing in the mornings, but on occasion I do go out in the afternoon. I also like the after dark bite for stripers and walleye. I have not been out yet after dark as I really don't like fishing after dark when the air temp is in the 30's. As soon as things warm up a bit more I will start seeing what's biting after dark. It is a blast hooking into a 15 pound fish when you can't see anything and all your fishing is by feel. 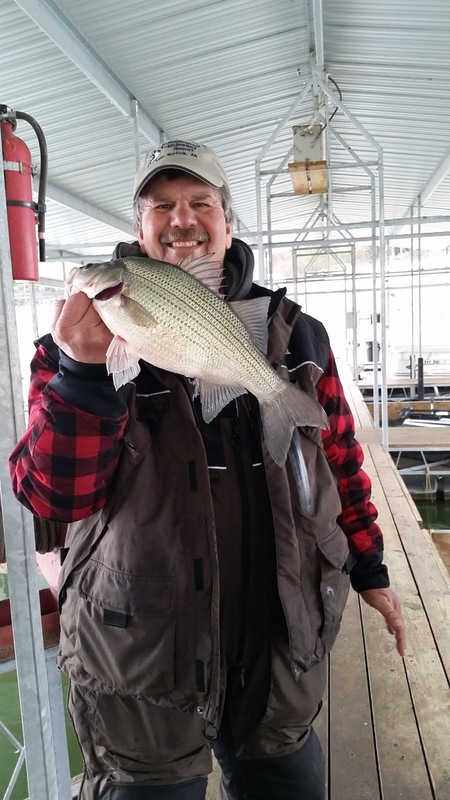 The Norfork Lake temperature varies from 48 - 55 degrees depending on where you are fishing. The farther up river and up creeks you go the warmer it gets. The water is brown from Red Bank to the 101 bridge, brown from Bennetts Bayou to Bidwell, and stained most other areas. 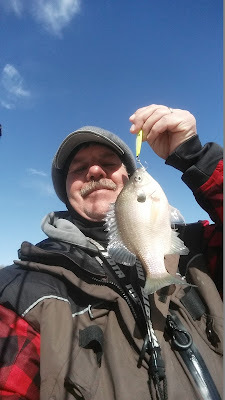 As you head south in the main lake the water clarity gets better and better. The current lake level is 552.56 and rising very slowly.